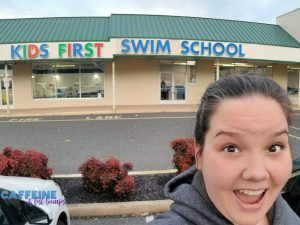 Recently, Caffeine & Fist Bumps partnered with Kid’s First Swim Schools in Cherry Hill for a review that I’d love to tell you about! 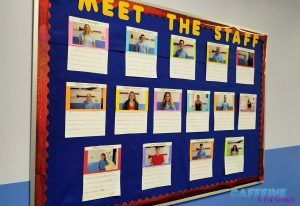 This is my honest review of Kid’s First Swim Schools – all opinions are totally mine and I have not been influenced in any way to reflect KFSS in either a positive or negative manner. When I was growing up, my family had a pool installed in our back yard when I was about 7. I’ll never forget the first time we opened the pool. The water temperature was in the 70s (read: FREEZING), but my brother and I couldn’t wait to go swimming! We were pretty chilly the first time, but we spent pretty much every summer day in that pool until the house was sold about 15 years later. Swimming was not only a great way for us to get exercise, but we also had so much fun. When the opportunity to partner with Kid’s First Swim Schools came up, I was definitely on board because I would love my children to learn to swim so they could have just as much fun as we did growing up. We arrived to our first session on a Wednesday afternoon. I was SO surprised that I had never realized this location even existed. It is tucked away in the Springdale Plaza shopping center at the corner of Springdale & Greentree Roads. Definitely easy to miss, but also definitely NOT a business you want to miss. We were greeted at the front desk by April, one of the Desk Supervisors of this location. After we got signed in, she gave us a little tour. I could tell that a lot went into the planning of this business! 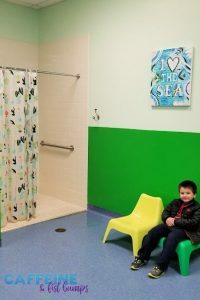 The floors are not the typical tile or laminate, but have a bit of a grip to them and are perfect for keeping little people with wet feet standing upright instead of slipping and sliding all over the place. I loved that there were multiple changing rooms – each with a lockable door handle, a bench, and a cute water-themed piece of art. There are also two bathroom areas. We only went into the women’s section, but I am assuming that the men’s would have typical features and amenities: 2 seperate bathrooms, a changing table, hair dryer, shower stall with shower curtain, and plenty of seating for children and adults. The boys especially loved the green and yellow seats you can see pictured. There are cube cubbies available in the bathrooms for you to put your belongings or everything can be brought out to the waiting/viewing areas. The waiting areas are pretty cool! 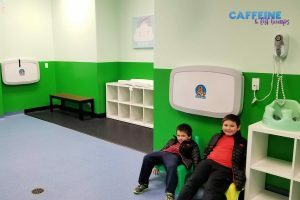 There are two separate waiting areas and not only are there multiple chairs for seating, but there are also a few toys available for siblings that may be waiting for their big brother or big sister to finish up with their lesson. That is such a thoughtful addition, right? Now, my favorite thing about the waiting room? The two-way mirror separating the waiting area from the pool. I was able to watch the boys get their swimming lessons, but they couldn’t see me and get distracted. PERFECT! I also loved that the pool water and room are always kept at a cozy 90 degrees, allowing children to focus on their lesson rather than being distracted by cold air or water. If you ask me, taking lessons during the fall and winter seasons is a great way to get out of the cold and warm up a little in the pool. Now, let’s chat a little about their lessons. They each had a total of 4 lessons in a small group setting. Big Dude was in the Level 2 class and Little Dude was in the Level 1 class. Every time the had their class, not only were they with the same instructor (except Little Dude had a sub for his final class, but that was a fluke), but there were also no more than 3 students total in each class. It was great that they were able to get that much attention from their instructors. As we were leaving lessons one night, I was speaking with Tina, the Manager of this location, and she was telling me how the instructors that they employ have all participated in their various swim teams and a number of them have even won awards. Who better to teach a child to teach than an award-winning swimmer, right?! So cool! It was so reassuring to know that the people teaching my children how to swim actually KNEW the correct methods and were qualified to do so. All in all, I’d say taking lessons at Kid’s First Swim Schools was a success! 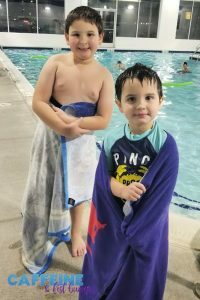 It was apparent that the boys got more comfortable in the water with each lesson and I loved that their instructors challenged them during lessons, but were also cognizant of how much of a challenge the boys could handle at a time. Although they “only” had lessons once a week, the boys asked every day if they could go to swim lessons. That’s got to be a good sign, right? Aside from swim lessons for kids ages 3-12, Kid’s First Swim Schools also offers Mommy & Me classes for children ages 3 months – 3 years; various options for adult fitness including swim lessons, water aerobics, and therapies (true story: The Mister does NOT know how to swim!! Should sign him up for a few classes! ); and (quite literally my childhood dream come true) birthday parties complete with mermaids!!! RIGHT?!?! In addition, Kid’s First Swim Schools also has family swim days/nights and special events. They usually post details on their Facebook Page, so give them a follow and keep an eye out for announcements. Definitely check out Kid’s First Swim Schools and let them know that Caffeine & Fist Bumps sent you!